The elk (Cervus canadensis) is one of the largest species within the deer family (Cervidae) in the world. It is one of the largest land animals in North America. Elk inhabits forested and forest-edge environments. It feeds on grasses, plants, leaves and bark. Male elks have large antlers, which they shed annually. Elk used to be pretty common in Michigan and disappeared only in the late 1800’s because of uncontrolled hunting and lack of habitat due to deforestation of the state. Similar situation occurred in elk habitats in other states. In the 20th century, some states began to bring the elk back. Among them: Pennsylvania, Wisconsin and Michigan. Michigan re-introduction began in 1918, when seven elks were brought to Wolverine from western states. 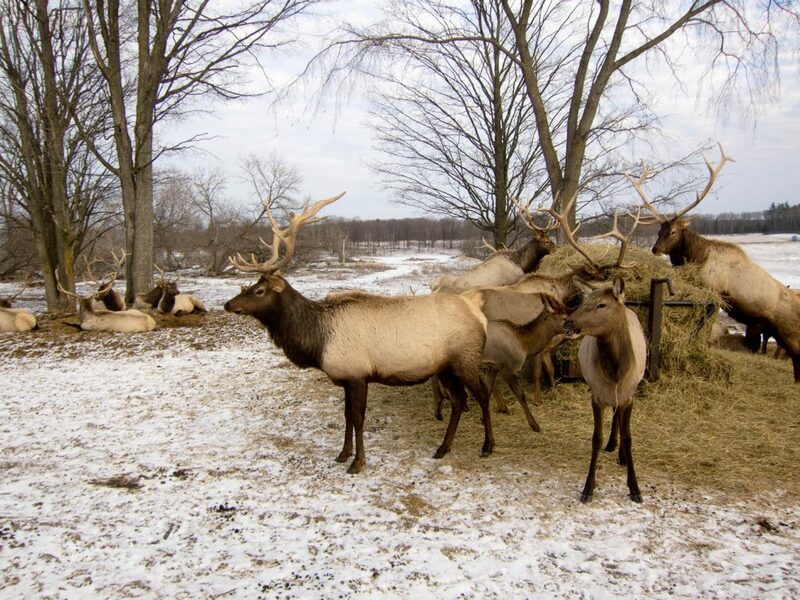 At present, the elk resides in the Pigeon River Country State Forest (east of I-75 and north of Gaylord, MI). The herd numbers over 1,000. 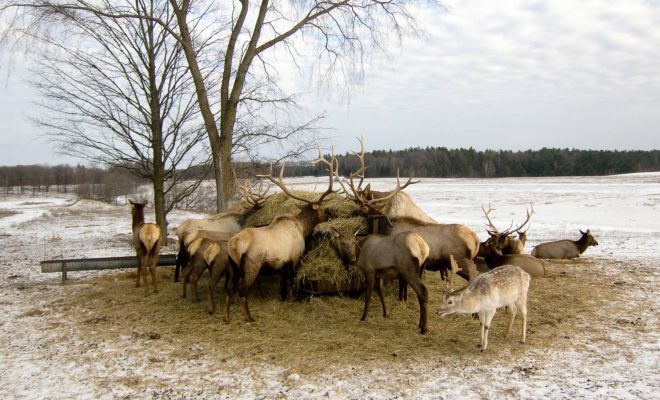 According to the Michigan DNR, the elk population is managed to stay between 500 – 1,000 heads with a goal to provide recreation through viewing and hunting. 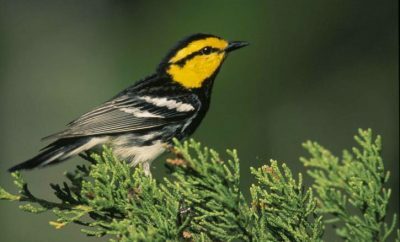 Regulated hunting is a way to manage the number and location of the animal in the state. Typically, between 100 – 200 elk licenses are available annually. The most popular time to view elk is during the fall breeding season. In September and October, the elk are in the open areas feeding on grass. In the summer, because of the dense foliage, the viewing is difficult and limited. The best times of the day are at dawn and dusk. 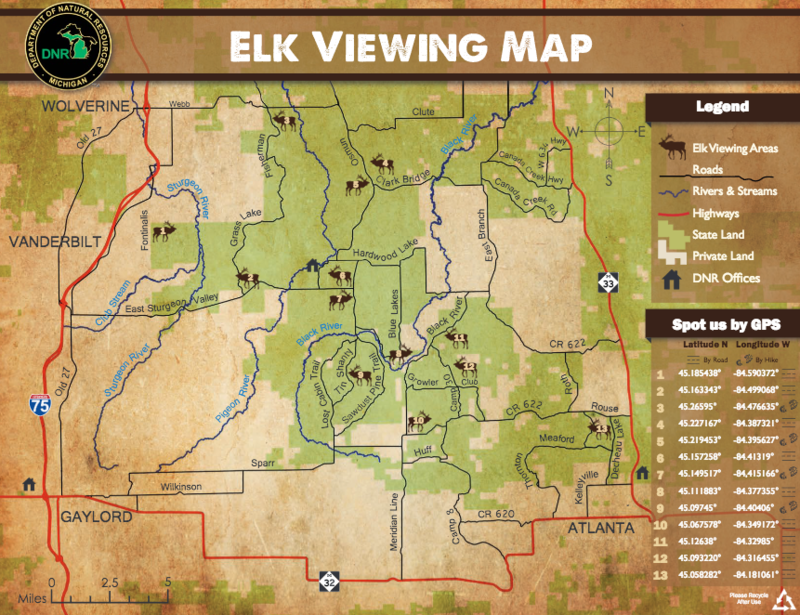 While there are many “official” spots for elk viewing on the DNR map, the elk will not be present there all the time. These are only suggested spots on the elk range, that provide good viewing environment. If you plan on going in the fall, you should try to do it mid-week, as elk viewing has become quite popular and weekends can be crowded at certain spots. Another good viewing time is from late April to early May. Elk is busy during day, eating the newly emerged green leaves. The best viewing is done from the car, since elk are accustomed to seeing cars. You should not approach the animals, as they are timid and will most likely run away. Full tank of gas, so you don’t run out of it, when you drive around from spot to spot trying to find the animal. On Fontinalis Road, about three miles north of Sturgeon Valley Road and near the Cheboygan County line, you will find a small cleared parking area and field. At the DNR-signed elk-viewing area on East Sturgeon Valley Road, about eight miles east of Vanderbilt. Less than one mile north of the Osmun Road and Clark Bridge Road intersection in the Pigeon River Country State Forest. Elk refuge in Gaylord, MI. 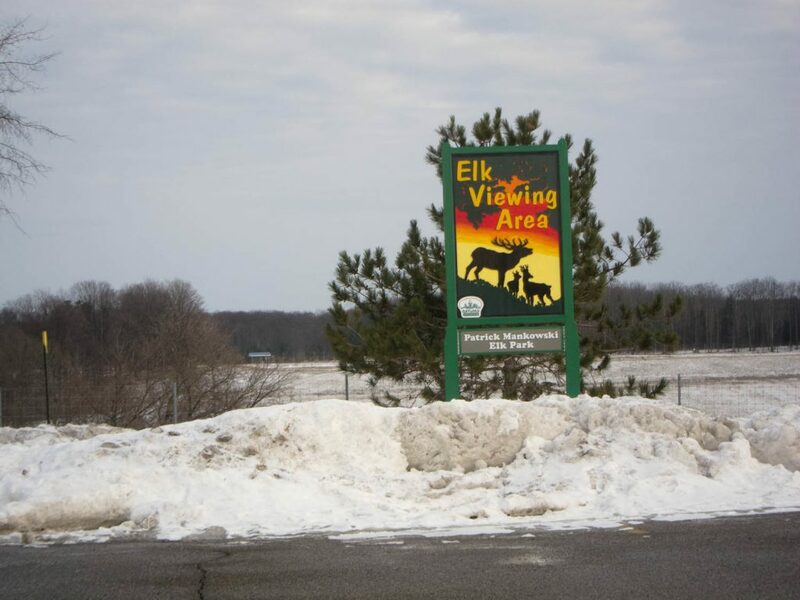 If you don’t have time or luck to see elk in the Pigeon River Country State Forest, there is still a chance to view the animals in the city of Gaylord. Yes, the city maintains an elk herd in a fenced, 108-acre refuge. Their herd numbers about 70 elk. It was started about 14 years ago with just 3 elk, when a local nature center closed. The best spot to watch them is near the Elk’s Lodge off Grandview Blvd. So, from my experience, you should not expect that if you go to see them in a wild, you will spot them every time. The first time I tried was in September, but it was in the middle of the day, since I was only passing through, going to the Upper Peninsula. Even though, I drove to few destinations specified on the map, I did not see even one elk’s tail! So, good luck to you, if you decide to go elk viewing! Share your story in comment section below, if you spot any. Tourists watching elk at the Gaylord refuge.